Consumer Product's Digest Reviews - Legit or Scam? Consumer Product’s Digest Reviews – Legit or Scam? 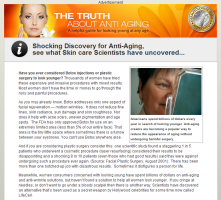 Consumer Product’s Digest, at www.ConsumerProductsDigest.org, is a new website which promotes a variety of products, and which is currently advertising an anti-aging product called LifeCell. Unlike Consumer Reports or other objective consumer review agencies, ConsumerProductsDigest.org is a webpage used for the promotion of specific companies, goods, or services. The articles on their website present their information as an objective, informational article, which is intended to influence visitors into believing that they are getting reliable, unbiased information about the product. But you can see by the heading at the top of the screen that in reality, Consumer Products Digest is acting as a paid advertisement for whichever product it’s currently representing. Right now, that product happens to be LifeCell, an anti-aging cream. In fact, these types of advertisements – which go to lengths to be appear as informational articles rather than advertisements – have been investigated by the FTC in the past and may no longer be allowed in the future. ConsumerProductsDigest.org at least has fairly noticeable labels indicating that they are, in fact, an advertisement as opposed to a journalistic article, but some websites are not so forthcoming. It is important for consumers to take the time to determine the source of the information they are receiving. If the website is actually a promotional site, this information can often be found in tiny, lightly colored print at the bottom of the page. When receiving information from a web page that is being compensated by a company for the information they are providing about them, it is important for you to do your own independent research about the product before you invest any money in it.